San Antonio, TX is very hot and humid in the summer so this is not the best time to visit the city. 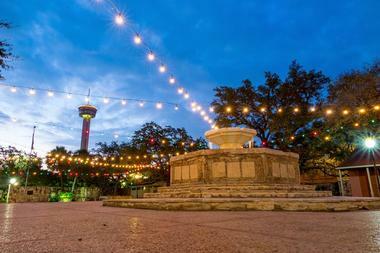 There are many people from Texas who visit San Antonio at this time of the year when their children are on summer break - this makes the city and its attractions very crowded, and the room rates are at their highest. The best time to visit San Antonio, Texas is from fall to spring - from November to April the weather is much more comfortable, there are far fewer crowds, and the room rates are at their lowest. 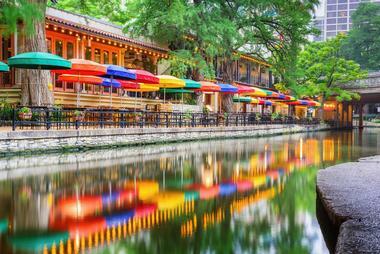 There are also many festivals during the winter and spring, especially at the River Walk San Antonio. January is the coldest month in San Antonio with high temperatures averaging 62°F (18°C). Average low temperatures sink down to 39°F (4°C). This month is also the driest in San Antonio with just over an inch and a half of rain (42 mm) to be expected. In February, the temperatures increase a little bit for the last month of winter. Average high temperatures are 67°F (20°C) while average low temperatures hover at around 42°F (6°C). San Antonio Weather in March: Spring begins in March at San Antonio. Temperatures remain generally cool during this season as average high temperatures peak at 74°F (24°C). Average low temperatures can get as low as 50°F (10°C). April’s climate sees average high temperatures of 80°F (27°C). Low temperature averages also make a bit of an increase compared to the previous month at 57°F (14°C). In May, the average high temperatures and average low temperatures continue to increase and range between 86°F (30°C) to 65°F (19°C). May is also the rainiest month of the year in San Antonio with an average rainfall of 5 inches (120 mm). San Antonio Weather in June: The heat is on in June at San Antonio as summer kicks off and the average high temperatures start breaching the 90s. Low temperature is 72°F (22°C). Now is the best time to head to nearby beaches or lakes to cool off from the scorching sun. July is the hottest month of the year in San Antonio as the average high temperature is a scorching 95°F (35°C). Average low temperatures offer a bit more respite at 74°F (23°C). In August the average temperatures stay exactly the same, tying with July as the two hottest months of the year. San Antonio Weather in September: The temperatures in September start going down as summer begins its last month in San Antonio. Average high temperatures drop down a few degrees to 90°F (32°C). Meanwhile, the average low temperatures decrease to 69°F (20°C). October marks the beginning of a relatively warm autumn season deep in the heart of Texas. Average high temperatures will hover just above 80 degrees at 82°F (28°C). The low temperature average is 59°F (15°C). In November, the average high temperature decreases to a cool 71°F (22°C). Average low temperatures are at about 49°F (9°C), so be sure to carry a decent sweater around with you in the evenings. December is the second to the coldest month in San Antonio next to January. The winter season brings an average low temperature of 41°F (5°C) while the average high temperature is 64°F (18°C). Late March through May is the best time of year to visit Texas in general. During these months, the weather is not as intense as usual and many attractions remain open despite it being the shoulder season. These months are also the best time of the year to visit Texas for rodeos and festivals. June and August are the best months for outdoor and water based activities such as beach trips, lake trips and excursions to the rivers. There are several ways to get to San Antonio. Many people arrive at the San Antonio International Airport. Located just seven miles from the city center, it has two terminals and is well marked and compact. Visitors who like to ride trains will enjoy arriving on one of Amtrak’s trains: they connect San Antonio with Los Angeles via Orlando, Houston, and New Orleans; another service goes to Chicago via Austin and Dallas. 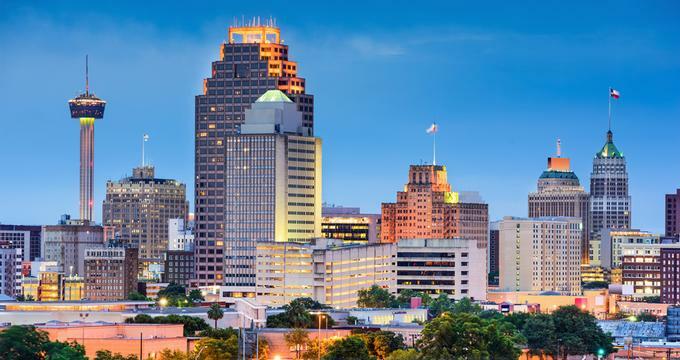 Arriving in San Antonio by car is easy: there are many interstates such as I-10, I-35, I-37, and I-410; and many U.S. highways like U.S. 87, U.S. 90, and U.S. 281. Greyhound serves San Antonio from other cities in Texas. 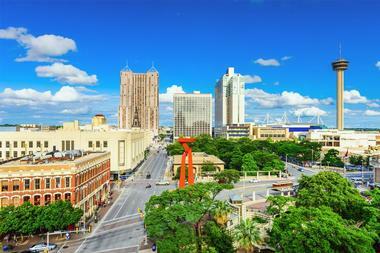 The San Antonio International Airport offers several ways to get to downtown San Antonio. There are nearly ten car rental companies with desks located in Terminal A. 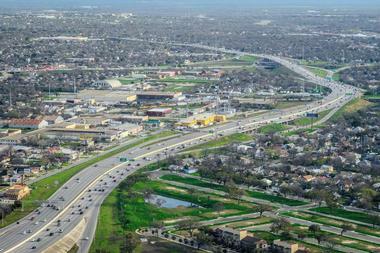 The airport is located close to U.S. 281, so it’s only a 15 to 20 minute ride into the city. Hotels near the airport offer free shuttles. The least expensive way to get from the airport into San Antonio is on the VIA Metropolitan Transit bus number 5: the trip takes between 40 and 50 minutes. SATRANS is a shared van service that takes visitors from the airport to their hotel. There is a SATRANS booth in both terminals of the airport. Taxis are another option. San Antonio’s Official Visitor Information Center is conveniently located across from the famous Alamo at 317 Alamo Plaza. Here friendly professional staff members can help visitors with a variety of needs. 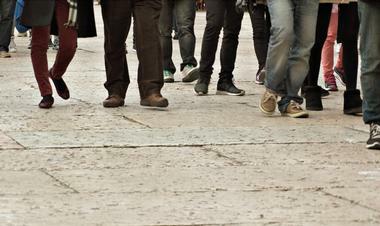 They can help visitors by giving them information about accommodations, attractions, and how to best navigate the city. The information center has many brochures and maps to give further information to visitors. The center also has information about tours and sells discounted tickets to some of the best attractions in the area such as Natural Bridge Caverns, SeaWorld San Antonio, Six Flags Fiesta Texas, Splashtown San Antonio, and many more. Navigating San Antonio by car is one of the many options to see its sights. Cars are easily rented at the San Antonio International Airport. 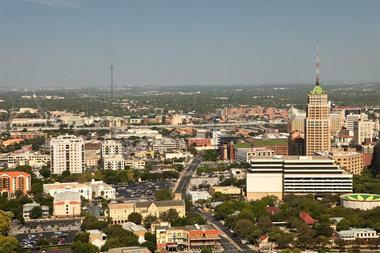 San Antonio’s downtown area is small and compact: this area is surrounded by commercial areas and old neighborhoods. Visitors will find it easy to find their way around downtown San Antonio but many of the 18th century streets are narrow. Because of this, some people park their car in a garage and explore the narrow streets of the historic center on foot. But using a car is the best option if you want to travel outside of the city to see some of the nearby attractions. There are some people who prefer not to drive a car in San Antonio and who want to use public transportation. The city’s bus system is a good way to explore the downtown area of the city: it is inexpensive and convenient. The VIA Metropolitan Transit’s buses offer many routes: there are single fares and an unlimited one day bus pass. Buses stop at many of the city’s top attractions. There is also a streetcar system that is operated by VIA. This system is made up of three different lines that run through downtown and stop at major attractions. 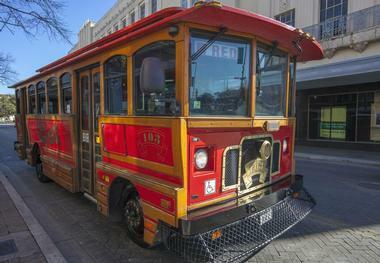 It is also a fun way to see San Antonio, especially for children. Walking is a great way to explore San Antonio’s historic city center. 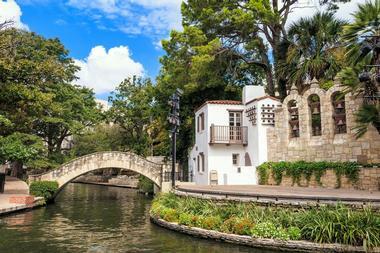 Visitors who walk can take in all of the main sights like the River Walk and the Alamo. Summer time heat and humidity can take its toll on walkers, so have plenty of water available and plan to do most of your touring in the morning and late afternoon: avoid the hours around noon in the summer in San Antonio. Getting from the airport to the city is easy, but using taxis in the city can be frustrating: they are hard to find. If you need to use a taxi, it is best to ask for help at your hotel. San Antonio offers a variety of restaurants, but most people who visit the city have one kind of food on their minds: Tex-Mex! And they are in luck because they will find many choices and some varieties of Tex-Mex cuisine. If you are not interested in Tex-Mex or want a change, you are in luck again, because San Antonio offers a variety of other types of cuisine. 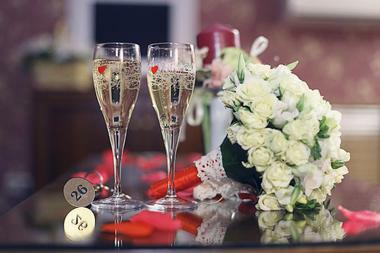 There are French bistros, German bakeries, Italian trattorias, and many more. The Asian Kitchen serves Asian food; Azuca Nuevo Latino Restaurant and Bar serves Latin American fare; and there are many restaurants serving American food, BBQ, and steaks. 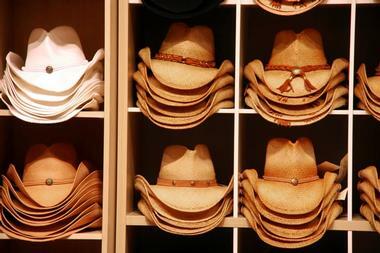 Shoppers will be happy to find a variety of ways to buy whatever they are looking for in San Antonio: they range from huge malls to quaint little boutiques that specialize in certain items, and shops that sell western clothes and accessories. Most visitors do their shopping in the downtown area. There is a large Sears department store and a Saks Fifth Avenue with a 40 foot high pair of cowboy boots standing in front of it. There is also a mall with a river running through it. For shoppers looking for bargains, there are outlet malls, farmers’ markets, flea markets, and fun and interesting Mexican markets. San Antonio, the second largest city in Texas after Houston, has many neighborhoods. Downtown is the most popular neighborhood in the city. This is the original site of the Spanish settlement and the attractions here include the famous Alamo and the three mile River Walk along the San Antonio River. Downtown is also full of hotels, restaurants, and shops. King William is a neighborhood that was the city’s first suburb: there are many historic buildings here built by the wealthy German merchants who settled here in the 19th century. A large portion of the city’s Hispanic population lives in the Southtown and South Side areas. Other neighborhoods include the Monte Vista area and the Alamo Heights area. Because of its unique atmosphere, San Antonio is a popular place for weddings. Marriage licenses can be obtained at the Bexar County Courthouse on Dolorosa Street. There are many hotels and ballrooms that make for good wedding venues such as the St. Anthony, the Sheraton Gunter Hotel, the Plaza Ballroom at the Menger Hotel, the Granada Ballroom in the historic 1930s Granada Building, and more. Some of the popular outdoor wedding venues include the Viola Ranch, Kendall Dry Comal Creek Vineyards, Lambermont Events, Oak Valley Vineyards, and Roszell Gardens. Other popular venues include the Witte Museum and the Southwest School of Art. There are many different types of accommodations that are available to visitors to San Antonio. These include hotels, motels, bed and breakfasts, inns, resorts, vacation rentals, ranches, and campsites, and RV parks. 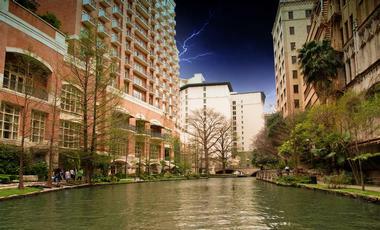 In the center of the city, there are many choices especially along the River Walk. These accommodations range from five star luxury hotels such as the Mokara Hotel and Spa and the Omni La Mansion del Rio, to family-oriented budget hotels. Some people choose to stay at accommodations that are close to theme parks rather than downtown. There are bed and breakfasts in some of the other areas such as the King William neighborhood and Monte Vista.